America, primarily Colombia, Brazil, Peru, Ecuador, Venezuela. 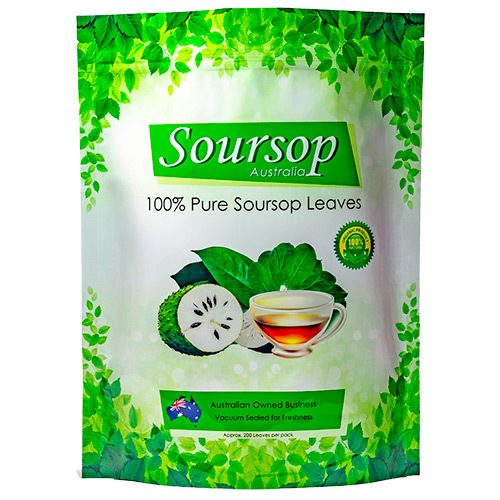 Soursop is also produced in all tropical parts of Africa, especially in Eastern Nigeria and The Democratic Republic of Congo, Southeast Asia and the Pacific. It is in the same genus, Annona, as cherimoya and is in the Annonaceae family. The soursop is adapted to areas of high humidity and relatively warm winters; temperatures below 5 °C (41 °F) will cause damage to leaves and small branches, and temperatures below 3 °C (37 °F) can be fatal. The fruit becomes dry and is no longer good for concentrate. 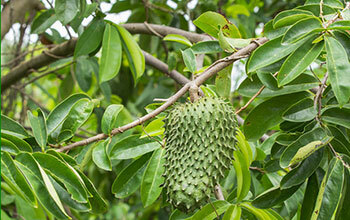 The flesh of the soursop fruit consists of an edible, white pulp, some fibre, and a core of indigestible, black seeds. The species is the only member of its genus suitable for processing and preservation. The pulp is also used to make fruit nectar, smoothies, fruit juice drinks, as well as candies, sorbets, and ice cream flavorings. 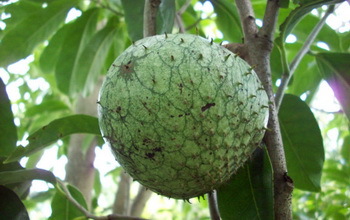 Due to the fruit’s widespread cultivation and popularity in parts of Latin America, the Caribbean, Africa, Southeast Asia and the Pacific, soursop and its derivative products are consumed across the world, also via branded food and beverage products available in many countries, including Brazil Mexico, Canada, the United States, the UK, Ireland, Continental Europe, Philippines, Indonesia, Japan, Malaysia, Singapore and Vietnam. In Mexico, Colombia, Venezuela, and Harar (Ethiopia), it is a common fruit, often used for dessert as the only ingredient, or as an agua fresca beverage; in Colombia and Venezuela, it is a fruit for juices, mixed with milk. Ice cream and fruit bars made of soursop are also very popular. The seeds are normally left in the preparation, and removed while consuming, unless a blender is used for processing. In Indonesia, dodol sirsak, a sweetmeat, is made by boiling soursop fruit pulp in water and adding sugar until the mixture hardens. 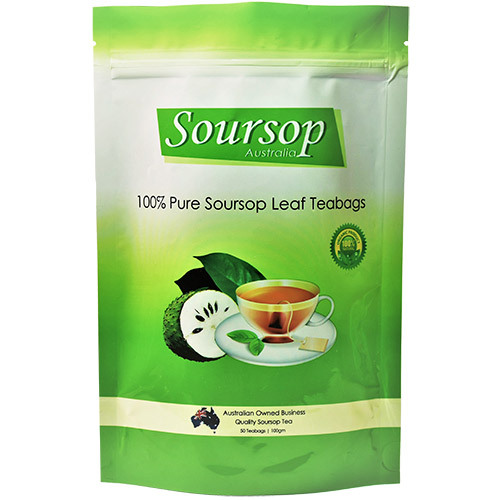 Soursop is also a common ingredient for making fresh fruit juices that are sold by street food vendors. In the Philippines, it is called guyabano, derived from the Spanish guanabana, and is eaten ripe, or used to make juices, smoothies, or ice cream. Sometimes, they use the leaf in tenderizing meat. In Vietnam, this fruit is called mãng c?u Xiêm (Siamese Soursop) in the south, or mãng c?u (Soursop) in the north, and is used to make smoothies, or eaten as is. In Cambodia, this fruit is called tearb barung, literally “western custard-apple fruit.” In Malaysia, it is known in Malay as durian belanda and in East Malaysia, specifically among the Dusun people of Sabah, it is locally known as lampun. Popularly, it is eaten raw when it ripens, or used as one of the ingredients in Ais Kacang or Ais Batu Campur. Usually the soursop fruits are taken from the tree when they mature and left to ripen in a dark corner, whereby they will be eaten when they are fully ripe. It has a white flower with a very pleasing scent, especially in the morning. While for people in Brunei Darussalam this fruit is popularly known as “Durian Salat”, widely available and easily planted. It was most likely brought from Mexico to the Philippines by way of the Manila-Acapulco Galleon trade. In Australia a variant (Annona reticulata) called “custard apple” is consumed as dessert.